Michael Udow (b.1949) is an Emeritus Professor at the University of Michigan (1982 – 2011) and was principal percussionist with the Santa Fe Opera (1968 – 2009, retired. 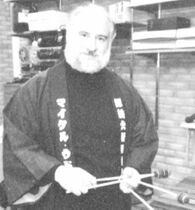 Michael was a member of the New Orleans Philharmonic and Summit Brass, Blackearth Percussion Group, Tone Road Ramblers and performed with Keiko Abe in a variety of chamber music settings over four decades. Michael has appeared as percussionist with the Detroit Chamber Winds, the Detroit Symphony on a freelance basis, and has also performed on numerous occasions with the Santa Fe Chamber Music Festival. Udow's compositions have been performed and recorded by the Rhode Island Philharmonic, Boulder Philharmonic, Colorado Chamber Orchestra, Madison Philharmonia, Richmond Symphony, La Scala Opera Percussion & Chorus, Bavarian Radio, NHK Japan, and by Keiko Abe, Michael has composed two operas, The Shattered Mirror and Twelve Years a Slave. The Shattered Mirror chamber percussion version of this opera with singers and dancers was premiered at the Percussive Arts Society International Convention in Orlando, Florida. His commissions include works for Eriko Daimo and Pius Cheung, Duo Sà, Ron Samuels, Longmont Symphony Orchestra, Music in the Mountains Festival, etc. His book, Percussion Pedagogy, is being published by Oxford University Press. Michael toured for 37 years with dancer choreographer, Nancy Udow in their duo collaboration, Equilibrium. He continues to accept short term academic and orchestral residencies at home and abroad having taught and performed extensively in Japan, Korea, Taiwan, China, and North America.